Black cohosh is not only one of the best herbs for fibroids but it is also beneficial for various types of other gynecological issues. 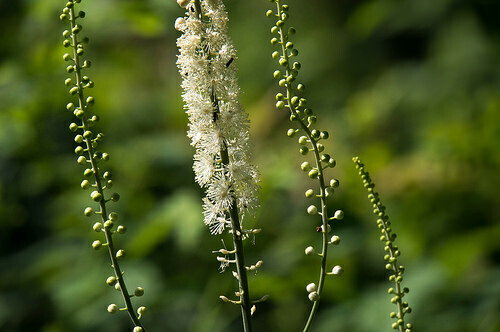 Black cohosh is also known as snakeroot, cimicifuga and squawroot. The properties of this herb that are used for healing are the roots and rhizomes (underground stems). PMS (premenstrual syndrome) can be treated with black cohosh. Menstrual cramps can be relieved with this herb. Menopausal issues such as hot flashes can be made less severe with black cohosh. Since menopausal women have less estrogen produced by their body, using black cohosh because of its phystoestrogens can help replace some of this estrogen. Estrogen whether from the body or a plant source can help relieve hot flashes. The risk of breast cancer can also be reduced by black cohosh. Breast cancer risk is increased by the presence of estrogen. Since phytoestrogens are weaker than the estrogen produced by the body, they can help reduce the risk of breast cancer posed by the chemically stronger estrogen produced by the body by bonding to estrogen receptors in the body which enables excess amounts of this estrogen that is produced by the body to be eliminated from the body which reduces the risk of breast cancer. Black cohosh can also help reduce high blood pressure but do talk to your doctor first before using this to manage blood pressure levels. As you can tell, it is the estrogenic properties of this herb that makes it one of the best herbs for fibroids natural treatment. Black cohosh is generally considered a tonic herb which makes it one of the safest to use on a long term basis as it strengthens and tones. While the causes of fibroids are somewhat mysterious, it is believed that an estrogen dominant state can promote the growth of various tumors including fibroid tumors as well as the worsening of symptoms of uterine fibroids, so black cohosh can help to promote hormone balance which can help reduce the risk of developing fibroids or the symptoms. By binding to the estrogen receptors, the much weaker phytoestrogens in this herb help to eliminate the much stronger estrogen hormones that are produced by the body which results in much weaker levels of estrogen in the body which can help promote hormone balance and prevent estrogen dominance. This herb can be used in capsule form or tincture, decoction or by making a tea or infusion. Black cohosh has a sharp, bitter taste and an unpleasant aroma but you can add lemon or honey to help improve the taste. You can make a bitter tea by adding two teaspoons of the dried roots in about a pint of water. Take about 1 tablespoon every few hours but this should be no more than a cup in total per day. For commercial preparations, simply follow the instructions on the packaging. Make sure the preparation states that it is black cohosh and not blue cohosh which should not be used by most women. Talk to your doctor first before using black cohosh if you are on other medication as this herb could interfere with the action of other medications. This may cause an allergic reaction and if it does, stop using it or reduce the dose. Black cohosh is one of the best herbs for fibroids as it helps to prevent an estrogen dominant state which helps reduce your risk of developing fibroid tumors, or encouraging any tumors you have to grow bigger as well as worsening uterine fibroids symptoms. For the best source for organic black cohosh, click here. For more on the best herbs for fibroids, you need the Fibroids Miracle guide which goes into much more detail and step by step instruction on the various natural methods to cure fibroids including herbal treatment. Find out more about this bestselling holistic guide here.